What a wonderful day. It began with the novelty of taking the train to the city. I live and work in the “outer suburbs” so quite enjoyed this break from usual routine. Took quite some organisation to get the girls to daycare, get back home, take the bus to the station and figure out the go card & which train to catch…but then was the surreal experience of blending in perfectly with a whole row of other iphone users! Such a luxury to simply sit still for around an hour (usually a 45 minute trip but were delays). Quite chilly in Brisbane this week (though my Dutch husband tells me it’s not really cold at all unless there is snow!) and was shivering a little when I arrived at the Incholm Hotel. However the warmth inside was immediately apparent. Not only is it a lovely hotel, nestled amongst other city buildings very close to Brisbane Central station, but had the pleasure of talking with the manager, Liz, who is a treasure! 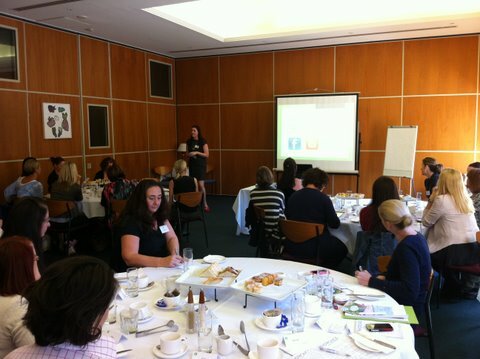 Was welcomed by Penny Webb from Working Mums Masterclass who organised the event. Though it was our first face to face meeting, as was mentioned several times that morning, so many of us already felt we knew each other well already from our interactions on social media. Penny is a talented event organiser and I was lucky enough to be sitting next to her. I was impressed not only with her beautiful, generous personality but also her super event checklist! We both kept busy scribbling away the whole morning trying to capture the many gems of wisdom of the three guest speakers as they shared stories of their mumpreneur journeys. Nikki Parkinson-Hubbard is in the midst of media attention after recently winning the Sydney Writer’s Centre best blog competion for Styling You. I’ve met Nikki before on the Sunshine Coast (where she is lucky enough to be based) and enjoyed getting to know her better. Absolutely loved her advise of “playing nice” and “sharing” in business. Bianca Shugg is a fellow Brisbane mumpreneur I’ve admired for sometime now and have followed her journey since her very first publication of Peekaboo Magazine. In the time I’ve known her, Bianca has continued to remain very humble despite her very obvious talents and increasing success. I also appreciate how open she has always been with the fact that making money in this “parenting industry” can be extremely tough and not as glamourous as it may at first seem. In her case, has meant taking huge risks such as selling her house to simply stay in business and break even. What I love about Bianca (and am sure will be the key to her long term success) is that she takes these risks with a very clear vision and game plan. I’m so excited to hear about her Sydney and Melbourne launches coming up – I’m sure she will take Australia by storm with this classy publication. It was a pleasure to see her gorgeous baby daughter again too, with her precious rosy red cheeks and very stylish outfit! Stacey Sullaphen is someone I had heard a lot about but had not yet had the pleasure of meeting. I can now most certainly say she lives up to her Sunny Mummy name. It’s not overexaggerating to say she radiated from the moment she walked through the door in her beautiful sky-blue dress. I can completely identify with so many aspects of her story and love her bubbly enthusiasm for life and for supporting other mums. She had us laughing from the beginning to the end and despite the many challenges in her life, is a shining example of how all of us can find ways to find the positive side of motherhood. I met so many amazing women, right up until the point of leaving the hotel – Ellie from Powermums and Danielle from Undercover Angels and I spent a good amount of time chatting in the street before heading off back to our lives as busy working mums. I took an afternoon off, with girls in daycare and a few hours spare so had the rare wonderful pleasure of just wandering for a while. We also received a overflowing goodie bag which i enjoyed unpacking when I got home.. A huge thanks to Penny Webb for organising the event to all of the speakers and everyone there. Despite the cold Brisbane morning, the room was just full of warmth, light, laughter and support and I’m so glad I had the opportunity to be part of it. What a great wrap-up!! Thanks Renee. As you know, when you’re head is right IN the organisation of an event, it’s great to get some feedback on what it was like just BEING at the event. I appreciate you coming and I appreciate your wrap-up. But really, couldn’t have gone wrong with those three as a speaker line-up. 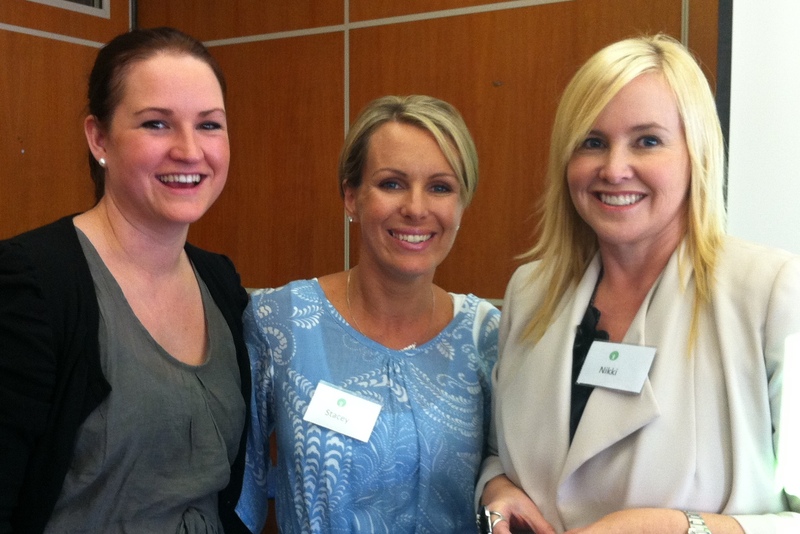 What a trio of Mumpreneurs!